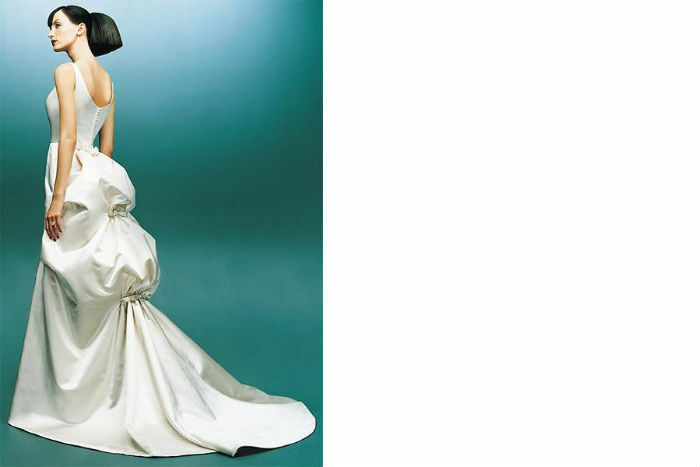 We are so pleased that the old fashioned bustle back gown has been reintroduced into the wedding dress world as a whimsically modern incorporation. It is haute couture at its most lavish. Most styles feature the bunching up of fabric around a woman’s waist with the functional purpose of adding fullness. It is completely regal and now considered very fashion forward and a bit cutting edge. some designers have coined when describing their bustle-like, voluminous styles. Look for Vera Wang and Claire Pettibone styles. Certainly not for those who are shy, the bustle back gown makes a statement. Why not pick something avant garde? You only wear the gown one day, so why not go big! what a phenomenal dress…and i must say, the layout of your blog is simply superb. so pretty!